Melbourne band ‘DIET’ have seemingly gone from strength to strength in the past few months: from gearing up to release new music to revealing an exciting upcoming tour schedule. Since they burst onto the scene in recent years, they have drummed up a devoted following, with many fans travelling far and wide to attend some of their biggest gigs to date. When commenting on their YouTube videos, fans have even gone as far as to call them “Legends” and a “Kool” band with “Amazing Music”. If you aren't aware, ‘DIET’ is a hot new five piece band signed by the ‘Hell Beach’ record label and made up of members Ben O Loughlin, Carlos Tinsey, Ted Mitchell, Andrew Taylor and William Clancy. Their signature incorporation of influences from UK underground sounds with synthesisers, into classic guitar lines makes for a new and unique sound. Their new single ‘Danny Boy’ was released this past Friday (27th April), and they are hopeful to continue on from the success of their 2017 releases. These included their “ode to the classic Aussie tradition of streaking” in “Clothes Off”, as well as their heartfelt love letter laid out in their summer beach hit “Take Me”, both released in 2017. 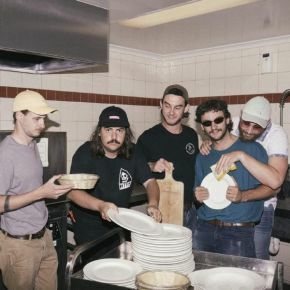 Recently, they had the opportunity to support Australian band ‘Polish Club’ throughout their sold out national tour, as well as playing at a range of sold out shows across the East Coast, including a show at Melbourne's famous 'GASO', now dubbed as their legendary ‘PIZZA Party’. Since this, they have gone from strength to strength, even officially joining the list of artists signed to the Australian Talent agency ‘New World Artists’. For anyone wanting to hear more, they are continuing to roll out a new range of shows in the coming months, even including Melbourne's Cherry Rock Festival. In it's 12th year running, this festival attempts to gather together contemporary bands and other talent from the punk rock genre from all across the globe, promising it to be an exciting event. Their headline national tour for Rare Finds and ten city tour as a supporting act for indie-rock band British India all the way through until July are a great opportunity to see them perform live. The only issue… for now, fans might have to travel all the way to Australia for this thrilling experience. This is not a band you want to miss out on.